If you’re concerned about the texture of your skin, or if you’re looking for an effective solution to combat the signs of aging in your face, the Fine-Light Mask treatment might be for you. Using UV-free, LED light therapy, light rays are emitted from the Fine-Light Mask, which then stimulate cell regeneration, and increases collagen and elastin production in the skin. Collagen helps plump the skin, reducing the appearance of fine lines and wrinkles, while elastin helps firm the skin, reducing sagging. Through utilizing this photo rejuvenation process, your skin can appear more youthful and radiant. You can either contact us online or call us today at (203) 779-6113 to schedule a free consultation with our Westport chiropractors. Contact us now and find out if our Fine-Light mask treatment is right for you! 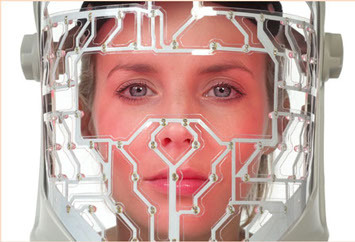 LED light therapy, like that used in the Fine-Light Mask, is completely safe and non-invasive. Free from harmful UV-rays, Fine-Light therapy has been used for years in a variety of settings and can help you achieve the results you’re looking for. While results will vary person-to-person, the average time in which a patient sees results is four to six weeks. While some may take longer, there are those who see results almost immediately! When you call Westport Chiropractic and Acupuncture, we will provide you with a free consultation, during which one of our chiropractors experienced in administering Fine-Light Mask treatments will discuss your personal goals and whether or not the Fine-Light Mask treatment is best for you. At Westport Chiropractic and Acupuncture, we are driven to do the most for our patients by always making their needs our priority. When you work with our Westport chiropractors, you will feel like part of the family while receiving the top-quality treatment you deserve. Serving the Westport community since 1985, we are the longest established practice in Connecticut. Our chiropractors have over 100 years of combined experience and are prepared to use our knowledge and experience to help you achieve your goals. Discover the Westport Chiropractic and Acupuncture difference; call us today at (203) 779-6113. Call now and schedule your free consultation with our Westport chiropractors!